After spending over 12 years developing new microsystems for biotechnology – especially concerned with the microfluidic aspects of these devices – Jean Berthier is considered a leading authority in the field. 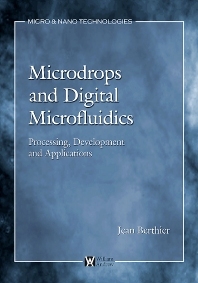 Now, following the success of his book, Microfluidics for Biotechnology, Dr. Berthier returns to explain how new miniaturization techniques have dramatically expanded the area of microfluidic applications and microsystems into microdrops and digital microfluidics. Engineers interested in designing more versatile microsystems and students who seek to learn the fundamentals of microfluidics will all appreciate the wide-range of information found within Microdrops and Digital Microfluidics. The most recent developments in digital microfluidics are described in clear detail, with a specific focus on the computational, theoretical and experimental study of microdrops. • Over 500 equations and more than 400 illustrations. • Authoritative reporting on the latest changes in microfluidic science, where microscopic liquid volumes are handled as ""microdrops"" and separately from ""nanodrops."" • A methodical examination of how liquid microdrops behave in the complex geometries of modern miniaturized systems and interact with different morphological (micro-fabricated, textured) solid substrates. • A thorough explanation of how capillary forces act on liquid interfaces in contact with micro-fabricated surfaces. • Analysis of how droplets can be manipulated, handled, or transported using electric fields (electrowetting), acoustic actuation (surface acoustic waves), or by a carrier liquid (microflow). • A fresh perspective on the future of microfluidics.